This exhibit showcases the relatively unknown story of suffering and hardships endured by Jehovah's Witnesses in Nazi Germany. 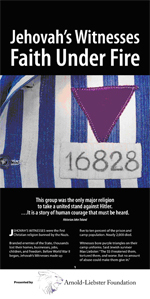 This small group was quickly thrust into the firestorm of Nazi terror, where through their unrelenting propaganda and pressure, male and female Witnesses, young and old, had to make a firm stand for their beliefs, often times facing severe reprisals and threat of death. Their story is one of immeasurable faith and courage, especially since they always had before them the opportunity to seek relief by signing a declaration to renounce their faith and give their allegiance to Hitler. They showed that is was possible to stand up against Nazi terror, even though they were a minority. Their story can inspire visitors to stand up against hatred and violence no matter what others do, or fail to do. Jehovah's Witnesses—Faith Under Fire premiered at the Florida Holocaust Museum in 2006 and remains a permanent part of their exhibition. Past venues for the traveling version of this exhibit include the Virginia Holocaust Museum, Mount Mercy College in Iowa, Scottsdale Community College in Arizona, Holocaust Memorial Resource & Education Center of Florida in Maitland, and Holocaust Memorial Center in Michigan.